This book profoundly moved me. Subtitled, My Psychedelic Love Story, it tells a tale of high adventure, courage, tragedy and the perils of publicly raising consciousness on a mass scale, among other things. It also tells a story of true love. Harcourt-Smith began tripping the bardo with the good doctor toward the end of his few years as a fugitive in exile from American cops. In the final weeks of Leary's freedom run, he and Joanna spent 49 days together becoming what John Lilly calls a "dyadic cyclone" by tripping, both in the sense of traveling around Europe and into Asia, and in the sense of taking acid every day. 49 is the number of chambers, one per day, the voyager travels through before taking rebirth according to the Tibetan Book of the Dead. "The Bardo was why Timothy took LSD so often - not to "party" or get high, but to learn how to "die" and trail-blaze the final frontier of consciousness." The effectiveness of his methodology gets debated to this day. 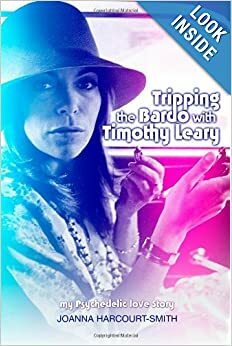 Tripping the Bardo with Timothy Leary (TTBWTL) sheds light and exposes darkness on the pros and cons of his unique way of life against a backdrop of international intrigue and the dubious distinction of being tracked and hunted by the most powerful country in the world. This book review comprises the second chapter of the Here To Go series. Tripping the bardo = here to go. TTBWTL keeps the bardo perspective throughout, thus by its nature making it a work of literary art that communicates deeply on many levels with many perspectives. This is Joanna Harcourt-Smith's story, before and during her position at the center of a cylone in a unique point of time. The writing engages, you won't want to put this book down. Simple, direct, yet highly articulate with a poetic touch at times. I really like how she includes the music she listened to along the way. The importance of music in her life and how she uses it to navigate the bardo - just that alone is worth the price of admission. For instance, at one point Smith and Leary are being illegally detained in Afghanistan in some hellhole of a hotel. She is very sick with hepatitis. They don't know what's going to happen to them. A Leary admirer and relative of the royal family visits them and promises to do what he can. He brings a tape recorder and player to do an interview with Tim. As he's leaving he asks if there's anything he can bring to ease the confinement. Joanna asks for a couple of classic Rolling Stones tapes. TTBWTL reveals a great deal of what Timothy Leary was like as a person that you won't find in any other biography of him. This seems his most intimate account. Obviously her perspective is biased, yet Smith's frank, confessional writing style makes that bias transparent. It doesn't get in the way, rather it embellishes the narrative with its sincerity and candor. Harcourt-Smith fully lives up to Dylan's maxim: "to live outside the law you must be honest" in her narrative. Experiential researchers of the more subtle varieties of consciousness are increasingly coming to understand the value of coincidences and synchronicities for navigating the bardo and providing voyaging information. Tripping the Bardo documents many stunning synchronicities. Though you might expect that in a mileau of consciousness experimenters, they, nevertheless, continue to produce an incredible sense of wonder never failing to thoroughly astonish. One of my favorites - Joanna and Timothy met and got together largely as a result of being separately drawn into the Rolling Stones orbit when the Stones were working in France recording Exile On Main Street. Leary, at that time, was THE exile on main street along with the Stones. The opening lyrics of the first song, Rocks Off go: "I hear you talking when you're on the street, your mouth don't move but I can hear you speak." Leary was known to demonstrate remarkable telepathic abilities at different times several examples of which you'll find in this book. Perhaps the most amazing coincidence comes at the end of the book when Joanna recounts receiving Island by Aldous Huxley as a parting gift from Timothy. She randomly opens it and in oracular fashion gets the most amazing passage - true wisdom and guidance perfectly timed to help with the crisis she was in at that moment. The passage is reprinted but to be truly amazed by it you need to read the whole book. It shines brilliantly after much pain and darkness, and tops off the bardo form of TLTBWTL. Aldous Huxley, apart from being a brief mentor for Tim, directly links Leary with Aleister Crowley. A transfer of a specific kind of baraka occurred there Crowley turned Huxley on to the idea of experimenting with mescaline. Huxley guided Timothy Leary in his psychedelic researches and presentations as documented in High Priest. Tripping the Bardo has many more anecdotes and instances of Crowley's influence on Leary. Early in their relationship he tells Joanna a very interesting interpretation of the Fortune card from Crowley's Thoth tarot deck. Fans of Robert Anton Wilson will note that Leary reread Illuminatus! toward the end of his prison years. That's the only appearance of Wilson in this tale. Other books Leary requested get mentioned, as well as how many times he read Gravity's Rainbow. Joanna Harcourt-Smith has endured unfair criticism at times that she was riding on Timothy Leary's coattails. After reading her book, this criticism seems ridiculous, quite the opposite. She appears the best thing that ever happened to him at that time and he acknowledges that more than once at the end of the book. It was her Will that eventually got him out of jail, moreso, it seems, than his own. After about 3 years of going nowhere with the legal process, she insisted that they become FBI and DEA informants to secure his release. That whole story gets told for the first time from an inside perspective other than TLs. People can decide for themselves the moral issues involved. It appears nearly beyond belief that Harcourt-Smith survived "riding Leary's coattails," or, as I put it, engaging in a dyadic cyclone with him. In her own words: " I followed him off that precipice, and my family, nationality, and sanity were fragmented beyond recognition." So why did she abandon a luxurious lifestyle of partying around Europe to living on little money fighting for Leary's release, a seemingly hopeless and impossible task? Of all the highs Joanna describes in her book, it seems the highest peak must have been the experience of Timothy Leary putting his full, undivided attention adoringly and lovingly upon her. Bringing the woman to life. He did this for 49 consecutive days, the length of time the Tibetans say that a voyager travels through the bardo before taking rebirth. It's inspiring to read her joyous and spiritual account of their first night together after having read Robert Greenfield's demeaning version of the same night in Timothy Leary: A Biography. I'd have to go with the person who was actually there. Greenfield does make an interesting point with his theory that Leary knew he was about to get popped and programmed Joanna to be his jailhouse girl, something that he definitely turned out to need. I don't fully agree with his assessment. Leary used what Crowley calls love under will to effect his magick. Joanna willingly allowed herself to be loved in that fashion, to drop her armor, and ascend to her rightful place on the Throne of Heaven. She voluntarily took rebirth as someone so in love that she would do anything within reason to get him back into her arms again and bask in his adoration. Tripping the Bardo explicitly reveals much about how Timothy Leary used magick, more than I've seen anywhere else including his own books. Many reasons to read this book. It reads on many levels. It's a close, articulate look of a dimly known side of American History. It shows, firsthand the highs and potentials of the 1960's counterculture along with the tragic factors that lead to the burying of that idealism. The attempt to use some drugs spiritually you'll read about along with the far too common random abuse, excess and poor choices that stigmatized this approach. It's one of the most courageous stories about a woman I've ever read. If you know nothing about these game players and care even less, it still makes an excellent, intelligent action/adventure story. The book is a real page-turner, I could easily see it turned into a film. Steven Soderbergh is my choice for Director. Jennifer Lawrence or Roony Mara would do a good job as Joanna, but I don't know who could play Timothy? Anyone interested in learning, and more importantly gaining some experiential feeling for the bardo should read this true voyaging tale. Tripping the Bardo With Timothy Leary shines as a multifaceted diamond, a precious stone of multitudinous beauty and tragedy. Robert Greenfield points out in his bio that Leary had a fascination with the anomalies of Time as they relate to expanded consciousness. Greenfield says that Leary's last words in Flashbacks, " ...it's about time" was a pun pointing to Time and he seems probably right. So, just for fun I looked at the last word of Tripping the Bardo. The last appendix is a listing of prisons and the last word in the book is San Diego. Diego = die go. You enter the bardo when you die, either physically or egoistically. At that moment, a voyager truly becomes "here to go." Just another one of those curious and curiouser coincidences that seem to follow bardo researchers. Joanna Harcourt-Smith played a leading role in Timothy Leary's book What Does WoMan Want? That was the first thing he asked her in real life. Tripping the Bardo reveals (surprising news to me!) that she got exactly what she wanted from him in the end. Maybe not everything she wanted, but the most important thing. You can read it and find out what I'm talking about.